The Greek economy is locked in a catastrophic downwards spiral. The odds of things getting better soon are trivial. Greece is now caught in a Catch-22. The government must slash spending and raise taxes as a condition for getting the bailout cash it needs to pay for government salaries, pensions and operating expenses. But the deeper Greece cuts, the more the economy shrinks and the less revenue it generates to manage its debts and eliminate its deficit. And the deeper the austerity, the more the Greek people push back, with violent strikes and protests. As recently as July, the International Monetary Fund was forecasting that Greece would eke out 0.6 per cent growth next year. Now, it appears the economy will shrink 2.5 per cent in 2012 after a 5.5-per-cent slump this year. And the more the economy contracts, the worse its debt burden becomes. And as life becomes more difficult for ordinary Greeks, they start to use their capital--economic, cultural--to prepare to leave their country for a better life elsewhere. In an Inter Press Service article, Apostolis Fotiadis' "Lost Generation Begins to Leave", there are suggestions that the predicted emigration has at last begun. A report published by the Labour Research Institute, belonging to the General Labour Union (GSEE) of private sector workers has predicted rapid deterioration. Officially more than 790,000 are currently out of work. The real numbers are higher because many are not counted due to logistical reasons. The young coming into the labour market are hit hardest, with unemployment of those between 15 and 29 years rising above 40 percent. This feeds the emigration wave. Some of the well-off are leaving as well. Andreas Kallisteris dropped a lucrative consultant’s job at the ministry of employment to follow his wife and son to Berlin. His wife, a self-employed translator, was also doing well, but decided to go. "We are thinking not to ever return," Kallisteris, a highly skilled professional involved in policy making for years told IPS. "I can’t influence the future and I cannot affect the choices made by a failed administration and political system. There are no prospects for this country. "I am leaving behind me a place that is becoming a desert. With the departure of the best human resources, phenomena like the rise of extreme right and underdevelopment will become acute social issues soon. I will only return if and when this generation that runs the country pulls out." Old migration roots have been revitalised since last year. People from north-eastern Greece, the hardest hit by the crisis, are trying to return to Germany and Scandinavia where their predecessors flourished as ‘gastarbeiters’ (guest workers) in the fifties and sixties. Countries in Western Europe, the United States, Canada and Australia are the most popular destinations so far. Up to July this year, 106,775 visits were recorded on the website of ‘Europass’, popular among those looking for jobs in the European Union. By August 55,073 documents were completed by people residing in Greece. In Australia, after scams that abused the credit details of people promised migration and jobs, the Greek community in Melbourne, that has one of the biggest diaspora communities of ethnic Greeks, has mobilised to accommodate seekers. The legacy pathway of the gastarbeiters migration is 50-years old. Today's relocation is a testament to the strength of the ties between two communities. Our unit of analysis for international migration is the nation-state. Aggregated in that data are important subnational connections, such as the "Greek" Diaspora in Melbourne. The lines of trust will lead economic refugees to a specific neighborhood in the city, not just anywhere in relatively prosperous Australia. Melbourne isn't necessarily the best rational choice for an immigrant. My Toronto may well see some new immigrants. 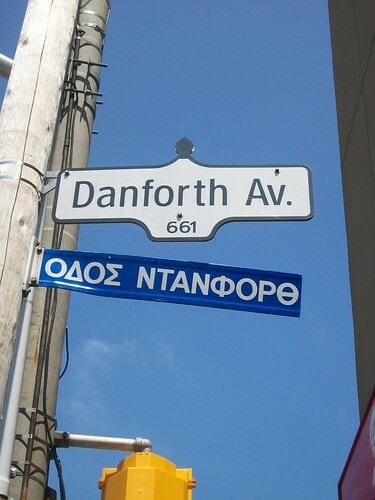 Toronto's Greektown, located around east-central Danforth Avenue, is one of Toronto's major ethnic enclaves and, despite the expected drift of second- and third-generation Greek-Canadians away from the area as rents rise and the upwardly mobile suburbanize continues to be a centre of the community. One thing I'd like to note is that these anecdotal reports, suggesting that Greek workers are responding to internal devaluation by seeking destinations where their living standards won't be compressed, suggest that the wider European Union is not the dominant destination for Greek emigrants despite the European Union's integrated Europe-wide labour market. The integrated labour market necessary for the functioning of a currency union, in other words, may well not be forming notwithstanding all of the economic pressures on it to form. The consequences of this, for the future of the Eurozone and the economic future of Greece--emigrants who travel far from Greece may be less likely to return, assuming an improvement, than emigrants who stay closer to the country--are evident. Greeks do not migrate to Germany, because that is a rough place, where workers are typically asked to work. When the going gets tough, Germans are not sacked with tens of thousands of euros in benefits, but are required to show up at least once a week. Then, the Germans are required to pay taxes. These things are largely true about Australia and Canada, but they still hope it ain't true. "Greeks do not migrate to Germany, because that is a rough place, where workers are typically asked to work"
What a staggeringly inane comment! As a Greek who has emigrated to the United States I can assure you that people here work a lot harder than in Germany for far less. We get way fewer holidays than Germany and don't even mention healthcare or other benefits that have to come out of one's pocket. Why don't we Greeks go to Germany ? I speak fluent German, graduated from a top European business school, have a lot of good German friends and not for a moment did I consider it. In the US (and I guess in Canada and Aus as well) if you work hard you're judged accordingly and you're given the chance to assimilate. I sincerely doubt I would have had the same opportunities in Germany given the current level of animosity and stereotyping. I really enjoyed to read your article, it good to reading, and thank you for sharing with us. I found this is an informative and interesting post, so i think so it is very useful and knowledgeable. I would like to thank you for the efforts you have made in writing this article. generally i don't read post on blogs, but i wish to say that this write-up pressured me to try and do it! i appreciate you writing this post and the rest of the website is extremely good. Thanks for this great post looking to find more quality post.